Damian Lillard and CJ McCollum combine for 51 points as the Blazers take a commanding 3-1 series lead over the Thunder. Buckle up for the Top 5 plays on a three-game playoff Friday night in the NBA. Russell Westbrook scores the turnaround jumper on Damian Lillard and does his 'rock the cradle' celebration. Russell Westbrook scores 33 points with four triples, 11 assists, five rebounds and a block in Game 3 versus Portland. Appeared in 587 games (570 starts) and averaged 21.5 points, 5.6 rebounds, 7.6 assists and 1.7 steals in 34.0 minutes. Appeared in 80 games (80 starts) and averaged 23.5 points (8th in the NBA), 10.4 assists (2nd in the NBA), 7.8 rebounds. Established new career-highs in assists (834), rebounds (626) and steals (163). Recorded 18 triple-doubles incuding 54 double-doubles. His 18 triple-doubles are tied for the most in one season since 1981-82 when Magic Johnson also recorded 18. OKC was 18-0 when he recorded a triple-double - the longest winning streak by a player in games in which he had a triple-double in a single season in NBA history and the longest such streak overall since the Lakers won 24 consecutive games when Magic Johnson had a triple-double from Nov. 1984 to Nov. 1987. Recorded a triple-double by halftime vs. LAL (4/11), becoming the first player since Kevin Johnson in 1997 to register one in the first half. It marked the second time in his career that he has recorded a triple double in less than 24 minutes. His seven tripledoubles in the month of March matches Michael Jordan (April 1989) for the most triple-doubles in a calendar month in the past 40 years and helped propel Westbrook to earn Western Conference Player of the Month honors for the second time this season. Voted a starter for the 2016 NBA All-Star Game and totaled 31 points, eight rebounds and five assists in the West’s 196-173 win. Pulled down a career-high 19 rebounds vs. Orlando (2/3), joining Jason Kidd as the only two guards with a 19 rebound game in the last 25 NBA seasons. Named Western Conference Player of the Month for December alongside teammate Kevin Durant after averaging 23.8 points, 8.9 assists, 5.9 rebounds and a league-best 2.73 steals while tallying three 30-point games and seven double-digit assist contests. After talling 121 points and 37 assists in his first week of the season, became the first player with at least 120 points and 35 assists through four games since Nate Archibald in 1972. Totaled 48 points, 11 rebounds and 8 assists at Orlando (10/30) alongside 43 points from Kevin Durant. The duo has scored 40-plus points in the same game on three occasions throughout their careers, the most by any two teammates in NBA history. Scored 40-plus points four times. Scored 30-plus points 13 times. Scored 20-plus points 58 times. Scored in double figures in 77 games. Forty-eight games of double-digit assists. Twenty-four games of double-digit rebounds. Fifty-four doubledoubles. DNP – Rest twice. During the he opened three Russell’s Reading Rooms in Oklahoma City bringing his grand total to eight. In March, hosted his 6th annual Why Not? Foundation Bowl. In December, hosted 65 homeless children at his 4th Annual Christmas Party at City Rescue Mission, giving away new shoes and backpacks. For Thanksgiving, Westbrook hosted his annual Thanksgiving Dinner at the Boys and Girls Club in Oklahoma City. 2014-15: Led the NBA in scoring with an average of 28.1 points and ranked second in steals (2.1) and fourth in assists (8.6). Named to the Western Conference All-Star team for the fourth time. Named the 2015 Kia All-Star MVP after leading the West to a 163-158 win on 41 points, five rebounds and three steals in 26 minutes at Madison Square Garden. Joined Wilt Chamberlain and Michael Jordan as the only three players to score 40 or more points in an NBA All-Star Game, finishing one point shy of Chamberlain’s ASG scoring record of 42 points. Named Western Conference Player of Month for April after averaging 32.5 points, 8.0 rebounds, 8.1 assists and 1.63 steals in. Earned Western Conference Player of the Month for March after averaging an NBAhigh 30.9 points while ranking second in assists (10.20) and steals (2.5) and totaling four triple-doubles. Named Western Conference Player of the Month for February after averaging 31.2 points, 9.1 rebounds and 10.3 assists, joining Oscar Robertson as the only two players in NBA history to average 30 points, 10 assists and eight rebounds in a calendar month. Scored 20-plus points in a career-best 15 consecutive games (11/28- 12/26). Recorded 20-plus points, 5-plus rebounds and 5-plus assists in a career-best nine consecutive games (11/28-12/16). Opened the 2014-15 season with a 38-point performance at Portland (10/29) which represented the second-most points for a Thunder player on opening night in the OKC era. Scored a thencareer-high-tying 45 points on a career-best 18 made field goals (31 attempts) alongside six rebounds and six assists in a win at New Orleans (2/4). With that performance, he became the first player in the 2014-15 season to post 40-plus points, five-plus rebounds and five-plus assists. Became the fourth player in NBA history with at least 45 points, five rebounds and five assists in back-to-back games (joins Kobe Bryant, Wilt Chamberlain and Elgin Baylor) with performances on 2/4 and 2/6, both against New Orleans. Recorded 21 points, a career-high 17 assists and eight rebounds in just 27 minutes vs. Denver (2/22), joining Magic Johnson as the only two players in NBA history to finish with 20- plus points, 15-plus assists and five-plus rebounds in under 30 minutes played. Recorded his third tripledouble of the season with 20 points, 11 rebounds and 10 assists in 28 minutes on vs. Indiana (2/24), becoming the fourth player (Larry Bird, Magic Johnson, Fat Lever) in the shot clock era to produce a triple-double in under 30 minutes played on three occasions. Used a careerhigh 49 points and 15 rebounds along with 10 assists to become the first player since Michael Jordan to four straight triple-doubles vs. Philadelphia (3/4). His 49 points marked the most in a triple-double performance in the past 30 years (tied with Larry Bird). First player in Thunder history to score 40-plus points in three consecutive games (2/28-3/5). Joined Magic Johnson as the only players in NBA history to post 30 points, 11 rebounds, 17 assists and four steals in a game (3/8 vs. Toronto). Recorded his sixth triple-double in an eight game stretch with 29 points, 12 assists and 10 boards vs. Minnesota (3/14). First player since Jason Kidd (2007-08) to have eight or more triple-doubles in a season. Scored a career-high 54 points with nine rebounds and eight assists at Indiana (4/12). Scored in double figures 66 times. Fifty-two games of 20-plus points. Twenty-nine games of 30-plus points. Eight games of 40-plus points. Thirty-one double-doubles. Eleven triple-doubles. Fourteen games DNP – Right Second Metacarpal Fracture. One game DNP – Right Zygomatic arch fracture. 2013-14: Scored in double figures on 45 occasions, including 30 20-plus point efforts and seven 30-plus point outings. Posted 11 double-doubles, including two triple-doubles (eight career triple-doubles). Made season-debut vs. Phoenix (11/3) and recorded 21 points to go along with seven assists in 33 minutes. Registered a triple-double vs. New York (12/25), becoming fifth player to post a tripledouble on Christmas Day. Returned to Thunder lineup vs. Miami (2/20) after missing the previous 27 games and scored 16 points to go along with five rebounds and three steals in 24 minutes. Recorded the second fastest triple-double in NBA history, logging just 20 minutes of action vs. Philadelphia (3/4) and finishing with 13 points, 10 rebounds and 14 assists. Posted a season-high 36 points on 13-of-22 shooting at Phoenix (3/6). Recorded 34 points, including a game-winning 3-point field goal in OT with 0.1 seconds remaining vs. Golden State (11/29). 2012-13: In 82 games (82 starts), averaged 23.2 points (ranked sixth in the NBA), 5.2 rebounds, 7.4 assits (ranked seventh in NBA), 1.77 steals (ranked ninth in NBA) in 34.9 minutes. Named to the All-NBA Second Team for a third consecutive season. Scored 20-plus points 56 times including 16 30-plus point efforts (Oklahoma City was 12-4 this season when Westbrook scored 30-plus points). Recorded a team-best 23 double-doubles on the season. Registered first tripledouble of the season (sixth of his career) on at Milwaukee (3/30) with 23 points, 13 rebounds and 10 assists. Posted 10 or more assists on 16 occasions. Set a season-high with 38 points (12-23 FGs) on at Denver (3/1). Registered a career-high with 27 points during the first half alone on vs. LA Lakers (12/7). On the night, finished with a career-high five made 3-point field goals. At the end of the 2012-13 season, played in 394 consecutive games (longest streak in the NBA). Scored 30-plus points in four consecutive games (1/14–1/20) for the first time in his career. Set a season-high with 14 assists on at Sacramento (1/25). Named a reserve on the 2013 Western Conference All-Star Team (his 3rd consecutive appearance). In All-Star game, recorded 14 points, four rebounds, three assists and a steal in 18 minutes. 2011-12: Named to the All-NBA Second Team for a second consecutive season. Finished the 2011-12 season with the fifth-highest scoring average in the league (23.6 ppg). Currently has the longest active games played streak in the NBA (312 games). Set a career-high with 45 points scored during 2OT win vs. Minnesota (3/23) after recording a career-high 17 made field goals. Along with teammate Kevin Durant, scored 40-plus points in the same game on two occasions (first duo to each score 40-plus points since Michael Jordan and Scottie Pippen accomplished the feat during the 1995-96 season). Recorded 21 points and five rebounds during his second career All-Star appearance in Orlando. Named the NBA’s Western Conference Player of the Week on two occasions. Recorded 20-plus points in seven consecutive games (longest streak of his career) from 1/10–1/23. Scored 20-plus points on 43 occasions (Oklahoma City went 31-12 in those games), including 16 30-point efforts and two 40-point efforts. Handed out 10-plus assists four times. Registered 10- plus rebounds three times and tallied seven doubledoubles on the season. Led the Thunder with 5.5 assists per game. 2010-11: Received All-NBA Second Team honors after becoming just the fifth player in NBA history to record 4,000 points, 1,500 assists and 1,000 rebounds through three NBA seasons (Chris Paul, LeBron James, Anfernee Hardaway and Oscar Roberston). Registered three triple-doubles (tied for 2nd most in the NBA) and 31 double-doubles. Ranked 13th in the NBA in scoring, 9th in assists and 4th in steals. Only player to start every game for OKC. Scored 12 points during his first All-Star appearance at STAPLES Center in Los Angeles. Placed second in the Taco Bell Skills Challenge during All-Star weekend. Recorded third triple-double of the season (fifth of his career) during 2OT win vs. Washington (1/28). With his 35 points, 13 rebounds and 13 assists vs. Washington he becomes just the third player in the last 25 years to hit all three of those statistical marks. Scored 20+ points on 47 occasions and 30+ 12 times (11-1 OKC record). Scored 20+ points in six straight contests for the first time in his career (1/8 vs. Memphis – 1/22 vs. New York) and then again 2/27 vs. the L.A. Lakers – 3/9 at Philadelphia). Recorded five straight double-doubles for the first time in his career (1/8 vs. Memphis – 1/19 at Denver). Received the NBA’s Player of the Week honors for the West Conference on five separate occasions. Scored 38 points including all 13 of OKC’s triple overtime points to go along with a careerhigh 15 rebounds during OKC 3OT win at New Jersey on 12/1. Became the sixth player and just the second guard (Vince Carter) in the last 20 years to record 35+ points, 15+ rebounds and 9+ rebounds in a single game. Netted a career-high 43 points (13-14 FGs; 17-18 FTs) during OT win at Indiana (11/26). 2009-10: One of four players to start all 82 games for Oklahoma City. Recorded 24 double-doubles on the season. Set a career-high with 16 assists 4/4 vs. Minnesota. Thunder went 23-5 when Westbrook recorded 10+ assists. Posted team-high assists totals in 67-of-82 games. Tallied 20+ points 24 times and 30+ points 4 times. Posted second career triple-double at Minnesota (2/21). In 38 minutes, tallied 22 points, 10 rebounds and 14 assists. Came one rebound shy of triple-double and finished with 31 points and 10 assists for his 12th double-double of the season at NY (2/20). Participated in T-Mobile Rookie-Sophomore Challenge and Youth Jam at All-Star Weekend in Dallas and led all scorers with 40 points on 18-29 FGs. Named NBA player of the week for contests played between February 1-7. During the seven day span Westbrook helped lead Oklahoma City to a 3-0 week, including two wins on the road (Golden State & New Orleans) while averaging 19.7 points, 9.7 assists, 8.0 rebounds and 3.3 steals. Posted double-figure assist totals in four straight games (12/28 – 1/4) and becomes first OKC player to accomplished the feat since Gary Payton did so in January of 2002 (1/3/02 – 1/10/02). Recorded 8th double-double of the season on 1/2 at Milwaukee with 17 points and 13 assists. With zero turnovers vs. the Bucks he recorded the most assists (13) without a turnover (in franchise history) since April 8, 2001 (Gary Payton; 15 assists, 0 TO’s). On 12/26 vs. Charlotte, tallied 22 points and game-high six assists while committing zero turnovers in 35 min. Notched 4th double-double in OKC win at San Antonio (19 pts/11 asst) on 11/14. With his 11 assists and zero turnovers, matched NBA season-high for most assists without a TO (Andre Miller). Recorded a then career-high with 13 assists during season opener 10/28 vs. Sacramento. With his 13 assists, he matched the entire assist total for the entire Kings’ team. Recorded back-to-back double-doubles (pts/ast) in first two games of season. On 11/6 at Houston, set career-high with 14 made field goals and finished with a game-high 33 points. On 11/8 vs. Orlando, recorded third doubledouble of the season (17 points, 10 assists) and matched career-high with three made 3-point FG’s. 2008-09: Named to NBA’s All-Rookie First Team. Ranked among rookie league-leaders in a number of statistical categories including scoring (4th, 15.3), assists (2nd, 5.3) steals (2nd, 1.36), minutes played (4th, 32.5), rebounds (7th, 4.9) and field-goal percentage (10th, .398). 10 or more points 71 times. 20-plus points 18 times. 30-plus points six times. 10 or more rebounds four times. 10 or more assists nine times. Ten doubledoubles. One triple-double. Five-plus steals three times. Scored 10+ points in 25 consecutive games (1/16 vs. Detroit through 3/14 at Phoenix). Recorded first tripledouble in Thunder franchise history with 17 points, 10 rebounds and 10 assists vs. Dallas (3/2). Career-high 12 assists at Minnesota 1/7. Career-high 34 points including career-high 20 free throw makes (20-22 FT) at Sacramento (2/1). The 20 free throw makes represent the most a Kings opponent since they moved to Sacramento. Was named NBA T-Mobile Rookie of the Month in December and February. 2016: In 18 games (18 starts), averaging 26.0 points, 11.0 assists, 6.9 rebounds and 2.6 steals in 37.7 minutes. Became the first player with a 35-point postseason triple-double vs the defending champions since Jerry West in 1969 - posting 36 points, 11 rebounds and 11 assists in Game 4 vs. Golden State (5/24). Scored 19 points in the third quarter of Game 1 of the Western Conference Finals (5/16) – the most points scored in a quarter by a Thunder player during the OKC era. In the same game, swiped a seven steals – a career-high and franchise record. Totaled 10 points, four rebounds and three assists in the fourth quarter of Game 5 at San Antonio (5/10), finishing with 35 points, 11 boards and nine assists. The first player since Isaiah Thomas in 1985 to score 25 points with 15 assists in back-to-back playoff games with 26 points and 15 assists at Dallas on 4/21 followed by 25 points and 15 assists two nights later. Six games of 30+ points. Thirteen games of 20+ points. One triple-double. Fifteen doubledoubles. Twelve games of 10+ assists, including three with 15+ assists. Four games of 10+ rebounds. 2014: During the 2014 postseason, appeared in 19 games (19 starts) and averaged 26.7 points, 7.3 rebounds, 8.1 assists and 2.2 steals in 38.7 minutes. Recorded three triple-doubles (only player in 2014 playoffs to record a single triple-double), eight double-doubles, 16 games of 20+ points and six games of 30+ points. Dished out a franchise postseason-record 16 assists vs. Memphis on 5/3. 2013: Underwent successful surgery on Apr. 27 to repair a lateral meniscus tear which was suffered in Game 2 vs. Houston in the opening round. Appeared in two games (two starts) during 2013 playoffs and averaged 24.0 points, 6.5 rebounds, 7.0 assists and 3.0 steals in 34.0 minutes. Recorded one double-double with 19 points to go along with 10 assists and eight rebounds during Game 1 vs. HOU. Nine DNP - lateral meniscus tear. 2012: Posted a playoff career-high with 43 points on 20-of-32 shooting during Game 4 of the Finals at Miami. 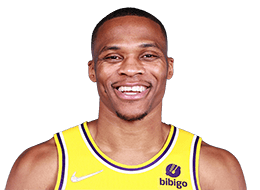 During the Thunder’s second round series vs. the L.A. Lakers, Westbrook played a total of 178 minutes and committed a total of four turnovers. Recorded a 2012 playoff-high 12 assists during Game 5 win at San Antonio in the Western Conference Finals. Scored 20+ points 11 times during the 2012 playoffs. 2011: Recorded a triple-double in Game 7 of the second round vs. Memphis with 14 points, 14 assists (playoff career-high) and 10 rebounds (playoff careerhigh) in 35 minutes. Westbrook becomes the fifth player in NBA history to register a triple-double in a playoff Game 7 (Scottie Pippen, James Worthy, Larry Bird and Jerry West). Scored a playoff career-high 40 points during Game 4 triple overtime victory over Memphis. Scored 20+ points 11 times while scoring 30+ on five occasions. Selected to appear on the Western Conference AllStar team five times and started in his most recent appearance. Named the All-Star MVP in both 2015 and 2016, the first time a player has received the award two consecutive years since Bob Pettit who won it outright in 1958 and shared the honor with Elgin Baylor in 1959. In his five All-Star appearances, averaged 23.8 points, 5.4 rebounds, 2.6 assists and 2.2 steals in 21.4 minutes. Won a gold medal in 2012 as a member of the United States Olympic team as the US squad went a perfect 8-0 during Olympic competition. In London, Westbrook appeared in all eight games and posted averages of 8.5 points, 1.6 rebounds and 1.6 rebounds. In 2010, helped lead the USA Men's National Team to a gold medal during the 2010 FIBA World Championships played in Turkey. Westbrook received player of the game honors during the US win over Lithuania and proved to be integral part of the United States perfect 9-0 mark at the World Championships. He appeared in all nine games and averaged 9.1 points, 2.8 rebounds and 2.6 assists per contest. Named Pac-10 Defensive Player of the Year as a sophomore. Earned Third Team All-Pac-10 honors and was named to the conference All-Defensive Team. 2007-08 (Sophomore season): Averaged 12.7 ppg, a team-leading 4.3 apg, 3.9 rpg and 1.6 spg. Played 1,318 minutes, the most by a Bruin since 1979 (when minutes began being tracked as a statistic). Led team with a career-high 22 points vs. Memphis in the Final Four on 4/5. Posted first career double-double with 14 points and a career- high-tying 11 rebounds vs. Western Kentucky in the Sweet Sixteen of the NCAA Tournament on 3/27. Tallied 16 points, four rebounds, five assists and a career-high five steals vs. Oregon on 2/23. Dished out a career-high nine assists vs. Youngstown State on 11/12. Pulled down a career-high-tying 11 rebounds vs. Stanford in the title game of the Pac-10 Tournament on 3/15. 2006-07 (Freshman season): Averaged 3.4 ppg and 0.7 apg in 9.0 mpg. Scored a season-high 11 points twice. Recorded season highs of five rebounds, four assists and two steals in 32 minutes at West Virginia in his first career start on 2/10. Parents are Russell Westbrook and Shannon Horton. Has one younger brother, Raynard. Attended Fashion Week in New York and Paris this past year. Admires Earvin “Magic” Johnson. Predominantly left handed except when it comes to shooting a basketball. Favorite subject in school growing up was math.